With the Great Backyard Bird Count on tap for February 15-18, I want to let you in on a not-too-well-kept secret that will help you attract birds to your home feeding station. It’s what I call Gourmet Peanut Butter & Jelly Suet, a homemade mix that puts ready-made suet cakes to shame. 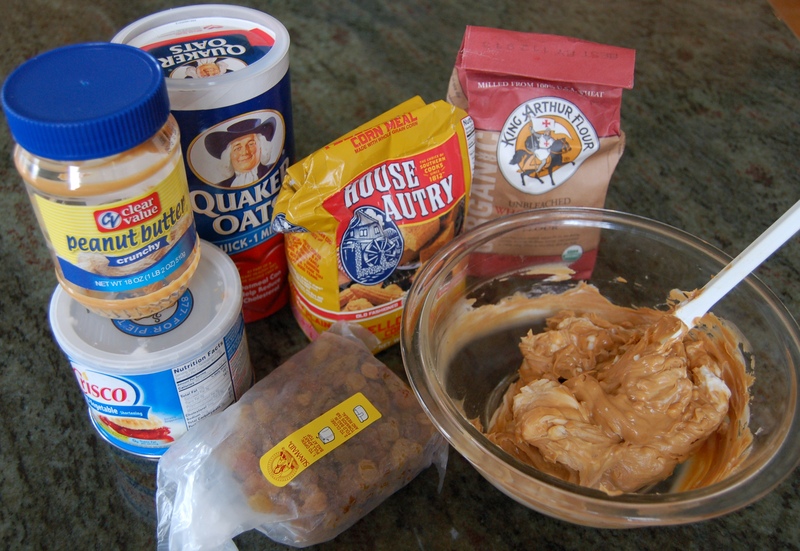 To make the tasty cakes, soften 1 cup crunchy peanut butter with 1 cup vegetable shortening in the microwave on 50% power for 30 seconds, stir, and then warm again at the same level for a few seconds more as needed. Stir in 2 cups each of quick cook oats and plain cornmeal, and 1 cup each of whole wheat flour and raisins. For an optional punch, you can add nuts and/or seeds. 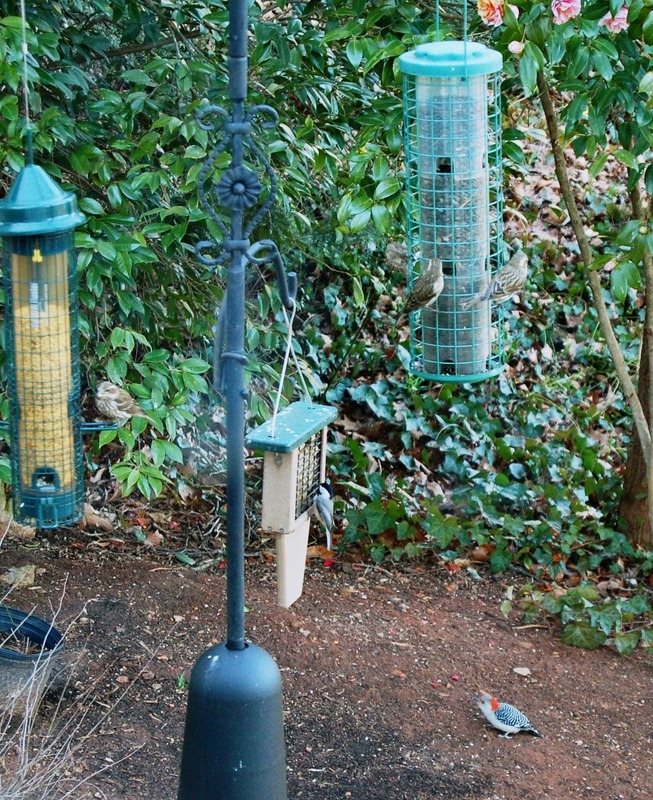 Easy-to-make homemade suet is a bird magnet! 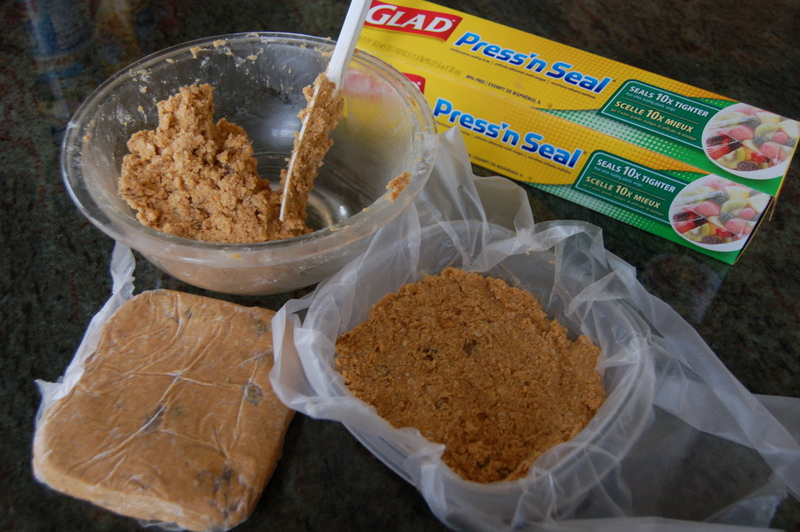 To fashion the cakes, divide the suet mix into 3 parts, pressing each into a small-size (5 inch square) plastic container lined with plastic wrap, and then refrigerate to harden. The cakes can also be shaped by hand, or the suet can be spread on pine cones or the bark of trees. Hang cakes in either a wire feeder or in the plastic netting of an onion bag. You’ll get 3 tasty cakes from every batch. In my experience, suet brings the most interesting birds to the feeding station. I particularly enjoy the outgoing Carolina Wrens with their ear-splitting call, teakettle-teakettle! As well as the much more shy woodpeckers. A greedy Black-Capped Chickadee makes a female Red-Bellied Woodpecker wait her turn. If you want to learn more about birds, including their calls, one of my favorite resources is WhatBird. This entry was posted in Gardening, Nature and tagged bird calls, birds, Black Capped Chickadee, Carolina Wren, House Finch, Red-Bellied Woodpecker, suet, suet cakes, White-Brested Nuthatch on February 11, 2013 by Marian St.Clair. Is this “recipe” tailor made for birds in the south or would it work over here in Germany? Everyone around here feeds the birds packaged food from the hardware store that comes in little netted balls. I have seen a total of three squirrels since we’ve been here (five months now), and they are definitely not like the ones at home. They are much larger and red in color. I have never seen one trying to eat bird food. fupaladin95–I would think the homemade suet would be great anywhere suet is normally offered to birds. Give it a try and let me know how it does for you. I don’t care what the birders say – I’d just HAVE to call that a Redneck Woodpecker! Will–I know, it doesn’t make sense! My Birds thank you Marian! Love your homemade idea! I will try this. I simply love your blog. Excellent!! I haven’t done my own suet cakes for the birds, but I guess I ought to. How do you keep squirrels from eating everything you put out for the birds? We tried every squirrel-proof bird feeder and baffel on the market but they outsmarted them all. Gotta give it to them, they are very smart but as much as we loved watching the birds, just couldn’t afford to feed the squirrels who seem to never get enough to eat. Hope you have a solution so we can feed the birds. Sandy–the only baffel we have is the one you see on the pole in the photo. The pole came with specific instructions on how high the baffle must be above ground (4 feet I think) and how far the feeders must be from trees, shrubs, and structures that could give them access. Those almost look like something I’d eat. No wonder you have plenty of birds. Thanks for the great recipe. I know what we’ll be cooking today! Thanks for the recipe. My mom makes her own similar mix as well. Instead of vegetable shortening, she uses lard. She also saves egg shells and dries them in the oven. Then powders them with a coffee grinder and adds it to the suet. Lard is, of course, animal fat and more like a big juicy bug. The ground egg shells give back calcium that the birds can use to make eggs of their own.